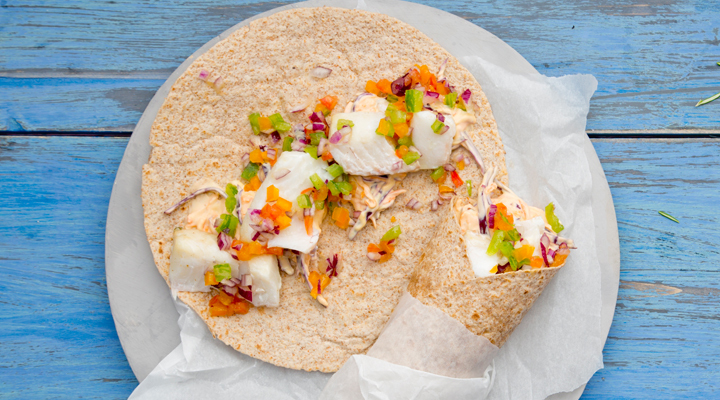 These fish tacos are a great addition to a BBQ party - a colourful dish bursting with flavour. Serve 2 as a main or 4 as a starter. Preheat the barbecue to a high heat. To make the salsa, mix all the ingredients together and season with salt and pepper. Mix the mayo and lemon juice together in a large bowl. Add the cabbage and carrots and toss together, then season to taste with salt and pepper. Season the cod, then squeeze the lemon over. Grill for 12 to 15 minutes, until cooked through. This will depend on how thick the cod is. When cooked, run a knife along the skin to remove it, then cut the cod into goujons. Wrap the tortillas in tin foil and heat alongside the cod for 5 to 10 minutes to warm them through. Fill the warmed tortillas with the fish and spoon over some salsa. Wrap up the tortillas tightly and serve the slaw on the side.